Rachel Von | The Journal Gazette Amanda Kaminskas and her daughter Grace, 5, stand with a group that presented petitions Tuesday at Citizens Square to get I&M to invest in renewable energy. 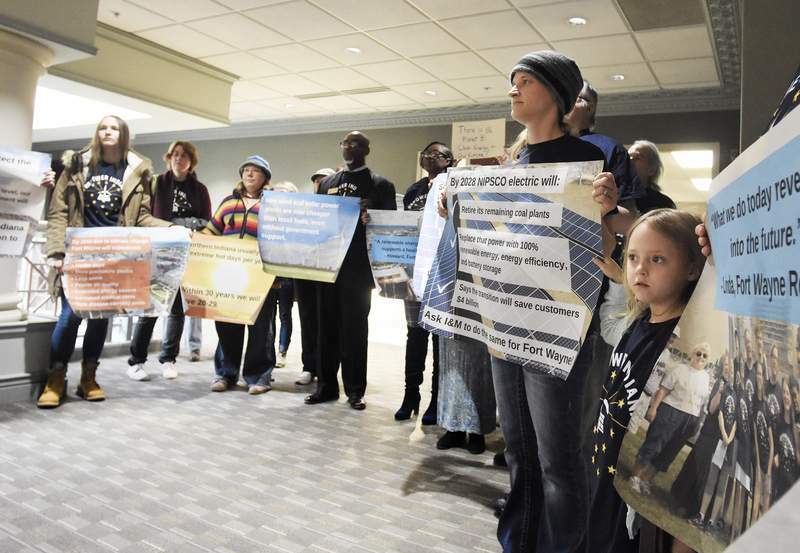 Several members of a group that presented 1,000 petitions asking Fort Wayne Mayor Tom Henry to sign a letter endorsing more investment in renewable energy left Citizens Square disappointed Tuesday morning. The petitions aimed to have Henry urge Indiana Michigan Power include more energy from renewable sources such as solar and wind in a 20-year planning document due to state regulators May 1. Members of the group pointed out that South Bend Mayor Pete Buttigieg and Muncie Mayor Dennis Tyler, both Democrats, have signed on. So have seven of nine Fort Wayne City Council members, both Republicans and Democrats. Republicans Russ Jehl, 2nd, and Jason Arp, 4th, were given the opportunity but did not sign, according to a letter the group presented to media. Hammand was one of about 20 people who came to Citizens Square's fourth-floor lobby outside the mayor's office with the petitions. Many were members of Hoosier Interfaith Power & Light, the Fort Wayne branch of the NAACP and the petitions' sponsor, The Sierra Club. As part of its planning process, I&M has indicated it wants to end a lease for Rockport Unit 2 by 2022 and phase out Rockport Unit 1 by 2028. The two coal-fired plants are seen as polluters by environmentalists and regulators. The letter asks the utility to commit to replacing Rockport's share of power generation with a system using solar and wind power and battery storage in a cost-effective way. The letter also urges I&M to provide more support for energy-efficiency programs geared to low- and fixed-income residents and encourage job-creating, renewable-energy projects in abandoned spaces. Perlich said the city has been addressing issues relating to renewable energy, climate change and fossil fuel use with both I&M and state regulators for several years. Among accomplishments cited by him and Doug Fasick, program manager for City Utilities, is a project to make the city energy-independent at the wastewater treatment plant by 2025. The city recently changed to more efficient LED lights in traffic signals and is switching to LED streetlights. Solar and hydraulic projects also are being studied for implementation by the city, Fasick said after the group's presentation. “It's difficult for us to pinpoint particular company and say 'You need to do X, Y and Z. '” Perlich said in explaining why the mayor did not agree to sign the letter immediately. He said signing would be solely the mayor's decision. In 2017 and 2018, two-thirds of the energy I&M provided was from emission-free sources resources, including four solar farms, the statement says. The utility also has generates nuclear power, and its parent company recently bought seven large-scale wind farms, including one in Indiana, according to the statement. The Rev. Brian Flory of Beacon Heights Church of the Brethren, an early member of the sustainable-energy group Hoosier Interfaith Power & Light, said I&M essentially holds a monopoly position in Fort Wayne.